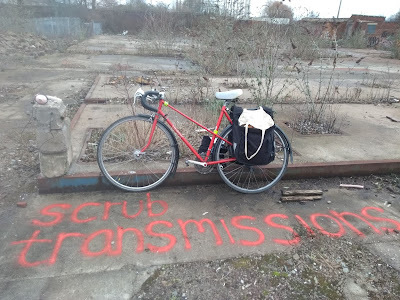 Visitors to the Victoria Baths Fanzine Convention in May will be able to step inside one of the country's more unusual zine stores – a zine shop inside a vintage caravan, which will be pulling up outside Victoria Baths for the day. 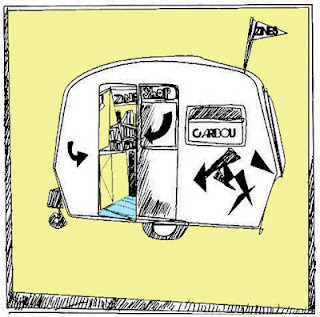 Nottingham-based artist and zine-maker Annie Atkinson set up Caribou in 2011 as a shop and gallery inside a small vintage caravan to showcase and sell the work of artists, writers and musicians working with an independent and DIY ethic. Annie makes the zine Flick my Ankle, as well as other mini-zine boxes such as Ultra Horse Fags and an ET mini-comic box. Caribou is filled with artists' work, records, found mix tapes and a ‘listening booth’ in the form of a Fisher Price tape player. Annie also has an illustration photo booth, where visitors can sit and, instead of having their picture taken, have a picture of their face hand drawn by Annie. The caravan is kitted out to incorporate seating when the shelves are folded away, so there is room to do small workshops and activities such as zine-making. As well as stocking fanzines, hand made books, cards, jewellery, mix tapes, records, prints and ceramics, Annie sells reconditioned typewriters that she has lovingly repainted. Among the more unusual items are flexagons: small, illustrated paper pieces that fold in on themselves three times to reveal different images. Annie says: “No-one seems to really get them! I have one with the characters of the Royal Tenenbaums, with different hairstyles in each folded image. You have to see it really to understand what I mean. Come into the caravan and you’ll see!” Annie's best seller is the Plastic Knife series comprising zines sent from Australia which come with a plastic knife stuck to the front cover. Annie says: “People go wild for them!” Japanese cut and paste zine Kosho Kosho, where the reader can cut out and make things like an illustrated paper iPhone, is also popular. Other big sellers are moustache teacups Annie paints herself. Visit Annie's blog at http://caricaribou.tumblr.com. 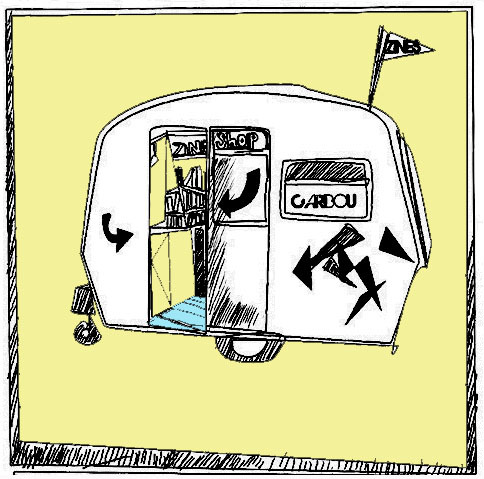 Step inside Caribou caravan at the Victoria Baths Fanzine Convention, Hathersage Road, Manchester, Saturday May 19 between 10am and 5pm. Exercise, muddy feet and fresh air are among the less celebrated benefits of viewing works of art, but visiting the Irwell Sculpture Trail is a chance to experience all three at the same time as seeing works by locally and internationally renowned artists. The 33 mile sculpture trail, which follows the River Iwell from Salford Quays all the way to Bacup in Pennine Lancashire, has been around for over a decade now, but recent reinvestment means that, as well as restoring some of the sculptures to prime condition, new, interactive features make the experience far more than just looking at art and going for a walk. A consultation was also held and, while there had been opposition to some of the sculptures at first, Diana says the artworks are now part of their communities: “There was so much local opposition to Tilted Vase in Ramsbottom, and Halo in Halsingden when they were planned, but people love them now.” Each area has a steering group, including representatives from tourist information and community groups, and they have a practical role commissioning temporary artworks alongside the trail. Some of the sculptures came about through the Section 106 planning clause, and councils along the trail made a commitment to spend the money on the arts, often involving the community. Many of the artists lived in the area where their contribution to the trail is based, and artworks reflect local stories. In Whitefield, near Bury, the artist talked to park rangers and discovered there used to be 'fancy birds' in the park in Victorian times, leading to a simple but effective artwork entitled Canaries in the Park, which comprises still, hard-to-spot model birds sitting still on the railings, and acting as silent spectators in the bowling green. The colour scheme was drawn from tropical sweets from the local sweet factory. Some of the birds have also been adopted by the community and adorn the town's rooftops. New signs and interpretation will help visitors make the most of their visit to each cluster, and QR codes have been added to the sculptures which anyone with a smartphone can scan to hear local stories as well as recordings of the artists and videos of events which have been held alongside the sculpture trail. Diana gives a macabre example: “An old mill owner used to throw children into the river in Salford when they were no longer needed and you can still see the gravestones along the river. There are little nuggets of stories like this to bring the trail alive. Children love gruesome stories; it adds another layer to the experience.” Visitors can also take part in a monster hunt in Rossendale and a geo treasure hunt. 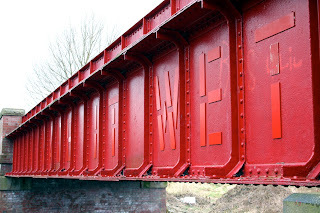 The Irwell Sculpture Trail works closely with other venues along the trail, and sculpture trail activities will tie in with events such as Bury Light Night and the chocolate festival in Ramsbottom, as well as the Olympic torch passing through Rossendale and Bury. An exhibition in light boxes at Piccadilly Station is currently linked up with the Ghost Cam at former stately home Ordsall Hall in Salford, one of the attractions which hosts sculptures along the trail, and performers from Salford's DIY Theatre Company have been bringing alive the Salford section of the trail. It's hoped future events will also include guided walks. With the relaunch of the sculpture trail website, and publication of a free, 32-page brochure in March, there's no better time to visit. The brochure, which will be available from local tourist information points, features information on each sculpture, including road names, parking, bus stops, toilets, places to eat and nearby attractions such as museums, and the website will host a route planner, ordnance survey information, news about events around the trail and resources for schools. Plan your visit to the Irwell Sculpture Trail at www.irwellsculpturetrail.co.uk. 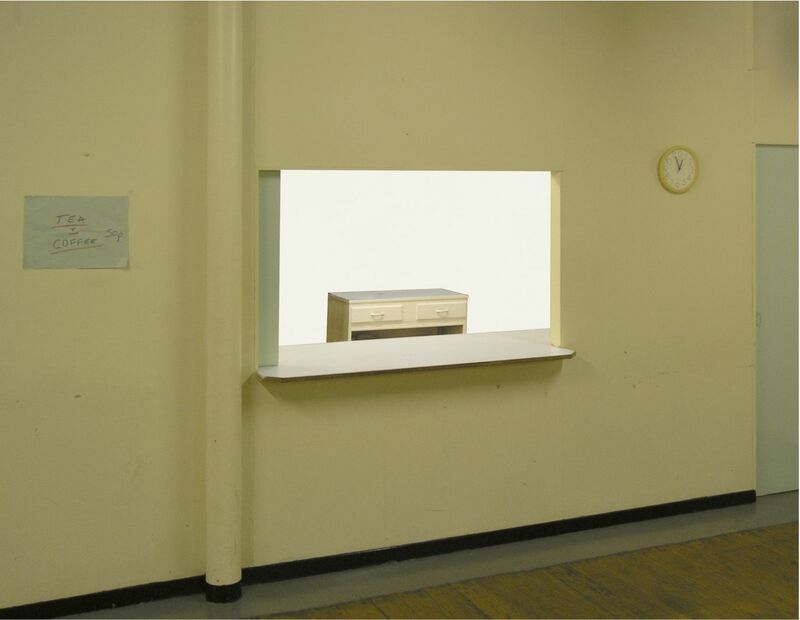 Berlin-based artist Antonia Low's work exposes what she sees as the 'impossibility of the white cube', a supposedly neutral place in which the visitor forgets their surroundings to concentrate on what is in the space, rather than the context in which it is displayed. In the past, she has used white cubes as starting points for installations that show up inevitable imperfections, exposing the infrastructure – a lift mechanism or wiring – hidden behind surfaces that are seemingly free of detail. For White Cube Longing, Low has created a single focal point in a room where once there was none. 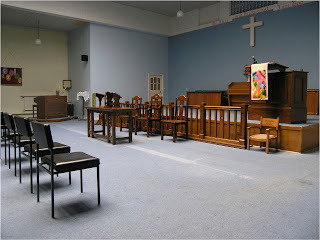 The basement space in which White Cube Longing is displayed in Salford's Chapel Street and Hope United Reformed Church has numerous distractions relating to its multiple uses, from a netball basket to balloons hanging from the ceiling to a girls' brigade logo. White Cube Longing is a pristine white room, viewed from a serving hatch, that is cut off from the rest of the space (and now, due to the false walls and floor of the installation, only accessible via the serving hatch). Illuminated in neon, the room looks almost surgically clean and new, appearing to stand independently of time and space, yet the installation was only made possible because of the space's obsolescence as a kitchen for preparing and serving food. The kitchen did not meet hygiene standards because the lack of a dishwasher meant cups could not be washed at the required temperature for public use. Eventually the kitchen will be refurbished, but until then the church's minister is content to let the installation remain as a 'step in the middle, a quiet space'. Low's installation draws you in, a glowing light among the basement's gloom. It also draws you into an institution which is in need of an attraction and a new purpose to get people through its doors. Once, churches were focal points for the community – places for routine and regularity, physical reminders among the rooftops of a common, unifying belief. Because of their scale, it's hard not to feel a sense of awed reverence and smallness in a church. As congregations dwindle, and ageing churchgoers are not replaced by younger generations, churches are shutting down and the buildings are left to face dereliction. Many are magnificent, but it's hard to find a new use for buildings so crafted and specific in their original intent and expensive to maintain. White cube galleries have been accused of imbuing artworks with an air of sacredness, or imposing a formal distance between the exhibition and the viewer. The one object on display in White Cube Longing is a cupboard, the oldest of several which had been added to the kitchen over the years as the building's use evolved. The lack of activity in White Cube Longing makes you notice the varied life of the rest of the building, a place associated not just with worship but the diverse people who use it for non-religious purposes. The basement of the United Reformed Church is usually accessed through a separate, back entrance, but the curators and artist made the decision to bring visitors to White Cube Longing in through the main church itself, and past a new cafe area which has replaced the one in the basement. Low's installation makes you ponder the building's adaptability and wonder what these places are for now, which have been around for so long, and what is lost if they disappear. White Cube Longing is the sixth in a series of performances, installations and interventions into the everyday around Manchester and Salford that comprise the Seven Sites project. Visit White Cube Longing at Chapel Street & Hope United Reformed Church, Lamb Court, Chapel Street, Salford, M3 7AA daily from 11am-4pm until March 30.